Createspace Independent Publishing Platform, 9781518678813, 380pp. Fans of Neil Gaiman, Holly Black, and Maggie Stiefvater will embrace the richly drawn, Norse-influenced alternate USA in book two of Gods of New Asgard. Signy Valborn was seven years old when she climbed the New World Tree and met Odin Alfather, who declared that if she could solve a single riddle, he would make her one of his Valkyrie. 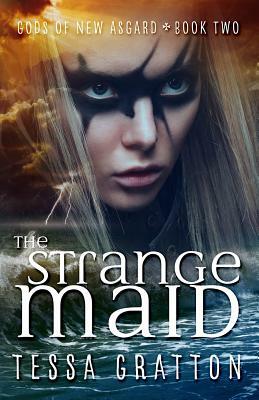 For ten years Signy has trained in the arts of war, politics, and leadership, but the answer finally comes in the form of enigmatic poet Ned the Spiritless, who tells Signy she must kill a Greater Troll Mother and claim its heart. But when you follow the god of sacrifice and poetry, everything is a riddle, and nothing is safe. Unfortunately, Signy is running out of time. Accompanied by an outcast berserker named Soren Bearstar, she and Ned take off across the ice sheets of Canadia to hunt the mother of trolls and claim Signy's destiny-as monstrous as it may be. Tessa Gratton has wanted to be a paleontologist or a wizard since she was seven. Alas, she turned out too impatient to hunt dinosaurs, but is still searching for someone to teach her magic. After traveling the world with her military family, she acquired a BA (and the important parts of an MA) in Gender Studies, then settled down in Kansas to tell stories about monsters, magic, and teenagers. She's the author of the Blood Journals Series and The United States of Asgard Series. Visit her at tessagratton.com, @tessagratton, tessagratton.tumblr.com.